When we bought Nacho, it was your run of the mill VW Vanagon with factory-built Westfalia cabinets. 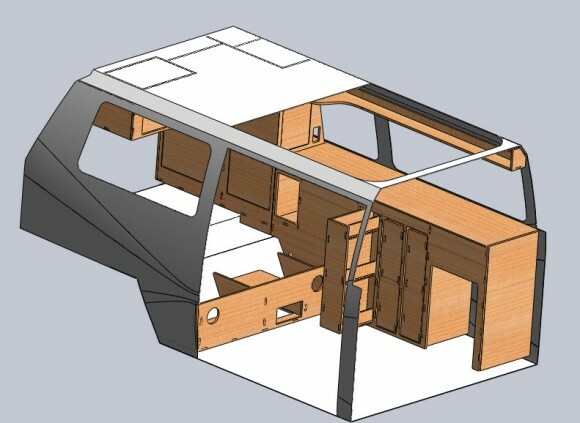 They were built by the meticulously manicured hands of the finest woodworkers in all of Bavaria, sure, but after several camping trips we felt that the layout of the Westy cabinets left a lot of wasted space. Moreover, we felt that if we were going to live in this thing for several years, we wanted to create an inviting space where we wouldn’t mind waiting out a 3-day bluff when we refuse to pay a bribe to get into Tajikistan. Or whatever. I’ve never built anything wooden in my life, save for the odd fake sword when I was a kid. No, woodworking was not in my briefcase of life skills. I am a mechanical engineer though, so naturally I told myself (and Sheena) in the smuggest way that it couldn’t be that hard. Just like any good engineer I started with the obvious first step. I modeled the system. 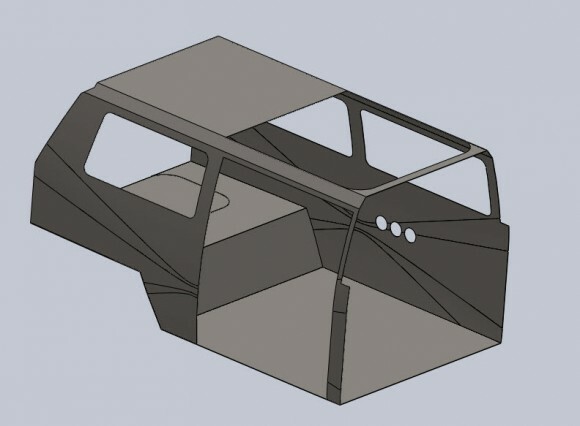 In this case, that meant recreating our van body in CAD. 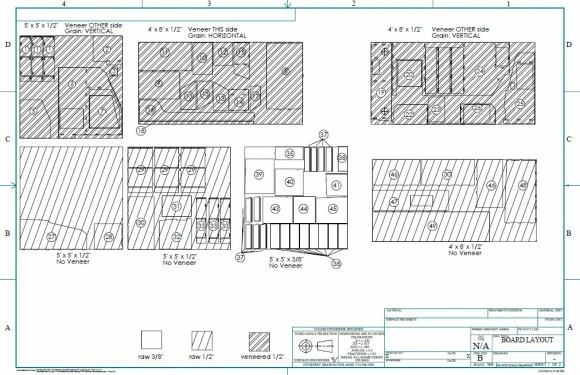 This amounted to me sitting in Nacho for hours taking measurements, and then translating it to a computer. Next, Sheena and I sat down and scribbled out a whole bunch of cabinet ideas. The subsequent six months amounted to a mind-killing, eye-gouging, baby seal-clubbing repetition of work and re-work until we had our virtual cabinets just the way we wanted them. Every seam just so. Each storage space tweaked in such a way. I wanted to hang myself every moment of every day. Sheena’s dad and brother are professional woodworkers, so they were quick to point out every place I went wrong. It would be done right even if it killed me. Finally, at long last, we had completed our stupid virtual cabinets. And when they were placed into our virtual van body, they fit just perfectly. You see, we engineers are masters at making things in our virtual world work just perfectly. In fact, we’re also really good at getting things to work as lab prototypes. In the engineering world we usually throw that turd over the fence to manufacturing and it’s someone else’s problem. Never mind that our creations may not be manufacturable. In a cruel twist of fate I found myself on both sides of that fence. At this point it was time to throw the turd over the fence to myself in manufacturing. 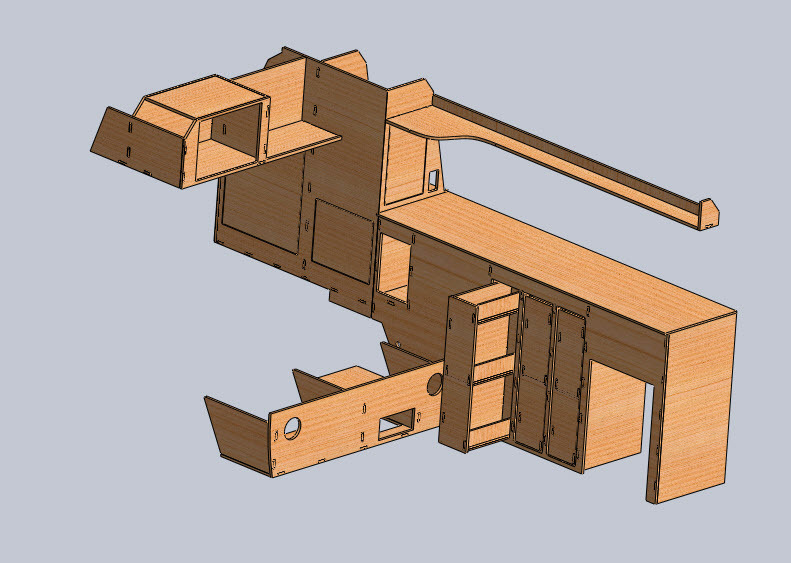 My intention was to send the files to a CNC machine and get nicely cut boards back, ready to assemble like a nice tinker toy. Inspection of my files by Sheena’s dad revealed one key weakness: my parts didn’t have tabs and pockets (think Legos) to make them stay together. Another million hours at the computer gave us tabs and pockets. Hundreds of tabs and pockets. 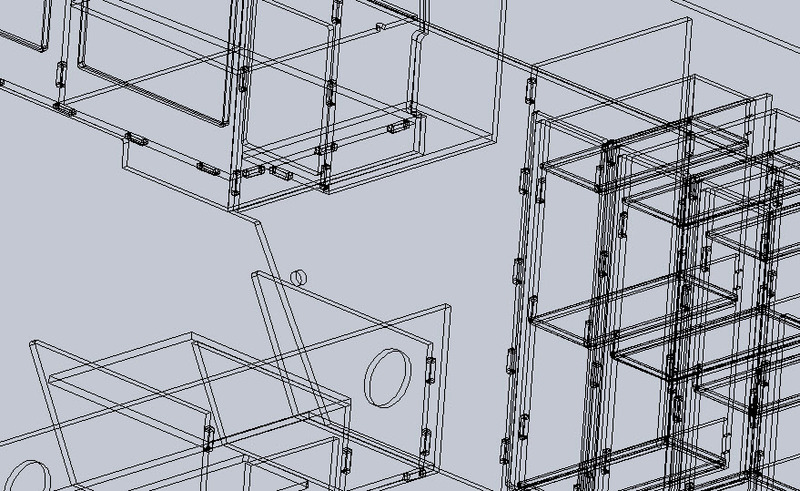 Check out this wireframe view of one small portion of the cabinets. If someone had told me that I was still doing the easy part I would have driven Nacho off of a cliff without a second thought. Nope, I just kept on walking straight into the fire. Finally, as I reached the end of my rope, Sheena’s dad gave his approval. We sent the parts to our friend James at Different by Design in Phoenix and he approved them too. All I had to do was provide a layout sheet showing how the boards would be positioned within the bigger wood sheets so that the anigre veneer was in the right direction. Gosh damn it. 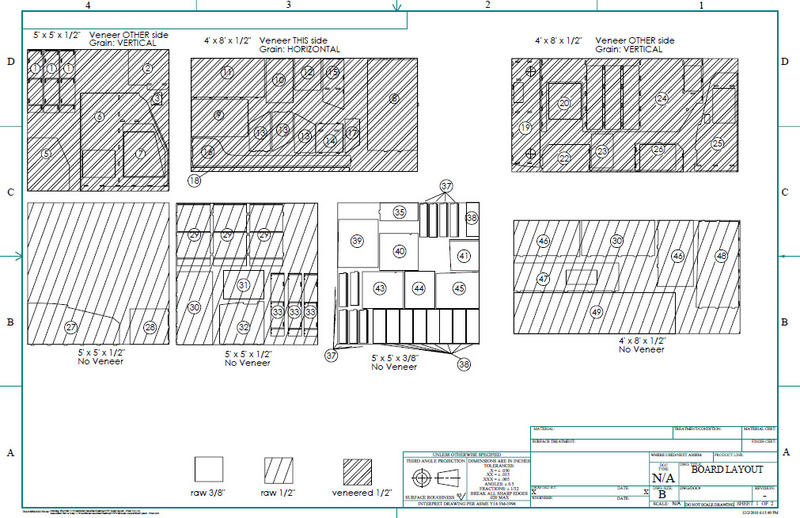 A few more hours bled into a few more days until I finally had an acceptable cut sheet. Files and cut sheets were sent off to James, and then we just sat back and waited. Woodworking. If it were easy then everybody would do it. Let the record show that this is the first official shout out to Ernie and Nick Wieber of Barrett Enterprises and Different By Design, respectively. Those dudes know their stuff and don’t cut corners (to my shigrin).